It's My Mind: Obama, the new Herbert Hoover??? 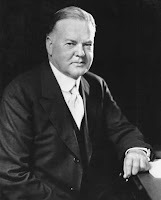 Obama, the new Herbert Hoover??? I am not convinced that the President’s political goose is cooked — yet. For one thing, luck can never be discounted. Recessions don’t last forever, anymore than booms do, and American capitalism is strong enough to stage a recovery in the face of poor policy. But luck aside, the President can still avoid the great mistake that finally wrecked Hoover: the failure to learn. President Hoover brought some convictions with him to office about how the economy worked, how government worked, and what his role as President should be. As the Depression deepened, he did the best he could within those limits, but nothing seems to have made him reconsider the mix of progressive ideas that he brought with him to the White House. As months of failure and disappointment grew into years, he doesn’t seem to have questioned those core ideas or to think about ways in which the economic emergency might require steps that in normal times would not be taken. He not only failed to end the Depression; he failed to give people a sense that he understood what was happening. Over-optimistic forecasts issued in part to build confidence came back to haunt him. To the public he seemed fuddled and doctrinaire, endlessly recycling stale platitudes in the face of radically new economic problems. That’s beginning to sound a little like the current President’s predicament. Unless Lady Luck should emerge from retirement to sprinkle some growth dust on the economy, the President could find himself looking more Hooveresque by the day. Worse, President Obama faces problems that Hoover did not have — notably the five shooting wars on his hands in Afghanistan, tribal Pakistan, Iraq, Libya and now, apparently, Yemen. At least Hoover in the beginning didn't have to deal with the Great Depression from the jump. Of course the Depression didn't just happen surely there were warning signs before the Stock Market Crash a few months into Hoover's Presidency. Obama on the other hand well the recession started just before he became President. I made the comparison but only judging on how Obama dealt with the recession. He took a beating in the congressional elections last year. We'll see if the Republicans can give the nation what the Democrats had been able to in 1932. Hoover didn't have the charisma Obama does, that may make the difference. Perhaps we can see the Republican answer soon.